China's CRISPR babies have hit the headlines across the world. For those who haven't caught it yet, a 33 year old biophysics researcher from China said he created the first genetically edited babies - twin girls named Lulu and Nana. It has kicked off heated debates across the world. Even before Crispr news, there was another interesting series of news items that I almost missed. If Crispr was about quality of kids, this was about quantity - China's One Child Policy. The declining birth rate is now one of the most talked-about topics across China - and there's a real sense of crisis. After decades spent trying to curb the population, state propaganda slogans now exhort couples to "Have children for the country", prompting criticism on social media that government policy is intrusive and insensitive. Measures now being discussed range from extending maternity leave to encouraging people to have a second child with straight cash incentives or tax breaks. Some are even calling for limits on the number of children to be abandoned altogether. I find China's family planning policies very interesting because it says a lot about how the world works. The world is complex and dynamic and can throw Googlies at policy makers. I suppose in our minds there is a plot that runs this way. 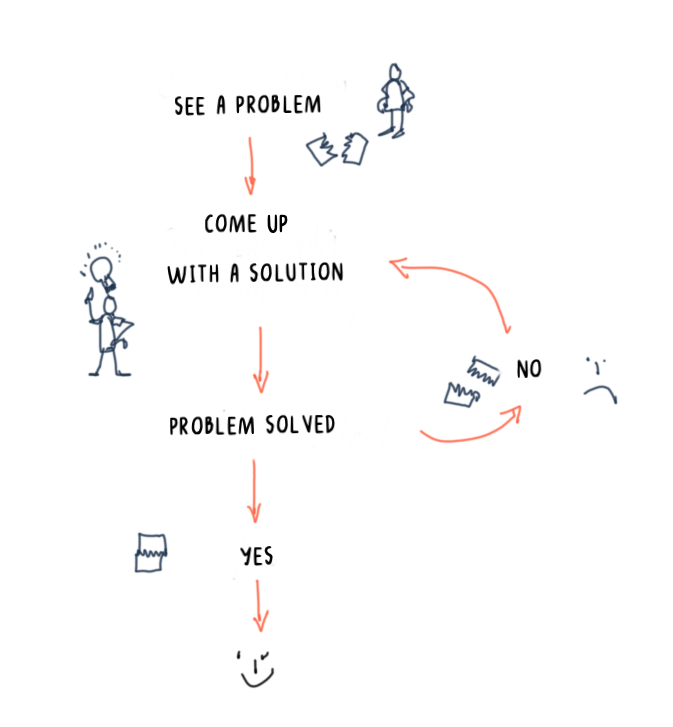 You come up with a solution. Sometimes, it might not work, so you come up with another solution. And then it gets solved. You have a problem. You often understand the problem through the symptoms, pretty much the way a doctor understands your disease by the way you describe your symptoms. He might do some additional tests, which are also often indicators of underlying problem. 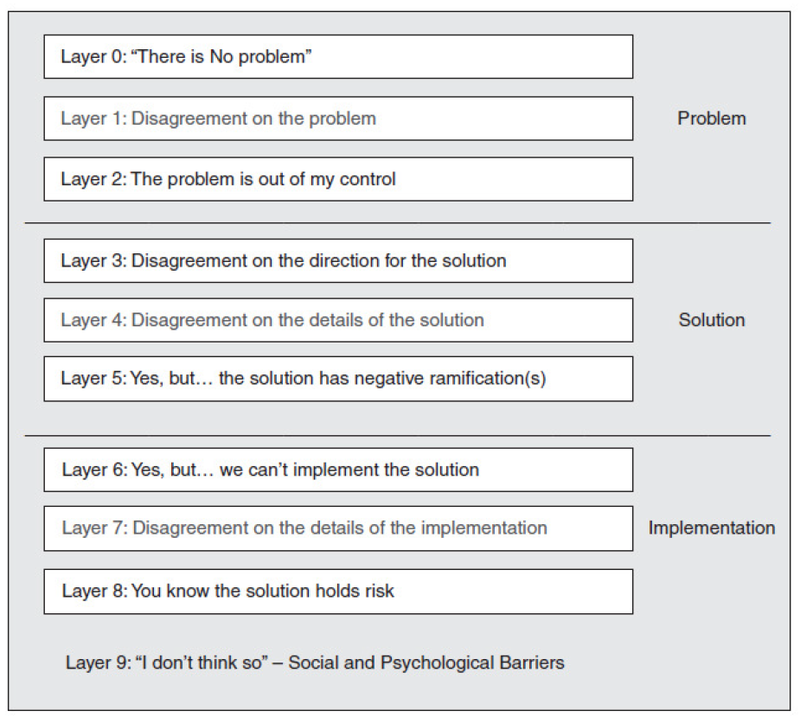 You device a solution, and then you implement it. 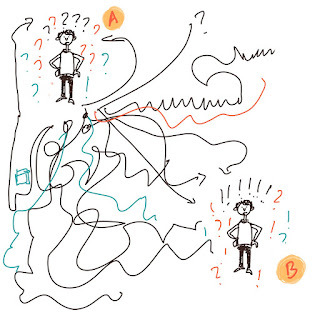 And they are shown as two different steps to account for translation losses. That action has immediate consequences. It affects the problem, and in someways modifies the problem. It has an impact on the symptoms of the problem. It has side effects - unintended consequences - and it side effects that show up after some delay. All of these can impact the problem too. In Economics in One Lesson, Henry Hazlitt says: "The art of economics consists in looking not merely at the immediate but at the longer effects of any act or policy; it consists in tracing the consequences of that policy not merely for one group but for all groups." Let's look at how it rolled out in the case of China's One Child Policy. In 1970s, Chinese population was growing at 2% a year. It might not seem big, but growing at 2% a year, population will double in 35 years. If your country's population is 500 million when you are born, you will be in a country with a population of a billion by the time you are 35. Two billion by the time you are 70. The entire world population in 1950 was about 2.5 billion. Interestingly, a few decades earlier, Mao Zedong encouraged his fellow citizens to have more children. More children meant more hands, and more hands are good for the revolution. If you think about it, that seems to be a tendency among ideologues. Romania's dictator Nicolae Ceaușescu did something similar, about whom we will see a little later. But such examples are not hard to find. We see people exhorting X or Y communities to have more children even these days. Of course, it was not the only reason why Chinese population grew in 50s, 60s and 70s. Population was growing primarily because of better healthcare. It's not just China, many countries were worried about high population growth, including India. In 1968, Stanford University Professor Paul R. Ehrlich wrote a book called Population Bomb which was quite popular in part because it reflected the fears of many people in those times. The book began with the statement: "The battle to feed all of humanity is over. In the 1970s hundreds of millions of people will starve to death in spite of any crash programs embarked upon now." RK Narayan's Painter of Signs tells the story of a man named Raman, a painter of signboards, who gets romantically involved in Daisy, a woman working in family planning. The book came in 1976. During emergency a couple of years later, Sanjay Gandhi became notorious for his forced sterilisation. China was more like Sanjay Gandhi than like RK Narayan's Daisy. It could simply go ahead and do what it wanted. A key intellectual backer of one child policy was influenced by Donella Meadows "Limits to Growth": It's interesting because Limits to Growth is a systems thinking classics, and systems thinking encourages you to keep your eyes open for unintended consequences. But it's also interesting for other reasons. Soan Jian, the man influenced by Limits to Growth, was a scientist who designed China's submarine launched ballistic missile. A total quants guy, who determined based on numbers that 700 million is China's ideal population and the way to achieve it is to impose one child policy. In many ways it's an engineering solution to a problem revealed by mathematical analysis of population trends. It throws some light on technocratic approach to policy making. Technology is neither good, nor bad, nor neutral: Birth control pills, contraceptives are technologies. Some would argue that they helped liberate women. There are possibly others who are against it for religious or ideological reasons. Technology by itself - as we saw in a previous post -is neither good, nor bad, nor neutral. It's true irrespective of whether you are looking at it from consequentialist perspective or deontological perspective. In China this was used as a policy tool. After the first child, a contraceptive was surgically implanted into women. More than 300 million women underwent this procedure. It joined other policy tools. Parents with more than one child had to pay penalty. They lost government jobs and children lost access to education. The problem with some solutions is that they work: All these actually worked. Fertility rate came down. The rate of growth came down from nearly 2% to less than a percent 0.7% now. At 0.7% it will take 99 years for the population to double. But they also have side effects, unintended consequences: Medicine works with a very complex organism called man. So, medicine is replete with stories on side effects. When policy hits the road, it travels with culture: China is in many ways like India. Unfortunately, in China too, there is a preference for a male child. If they were going to have only one child, many decided they will have a male child. As a result, there were abortions of female fetuses. According to one count 90% of of aborted foetuses were female.And then, a large number of girls became homeless or were sent to orphanages because they were born to parents who didn’t want them. The second order impact of male preference: What happens when there are more boys than girls? There will be more men than women. According to one count there are 34 million more men than women in China.These men are called bare branches, because they won’t bear any fruits, because they will not find any women. When a nation becomes old: In India we talk about demographic dividend. While the rest of the world ages, while advanced countries struggle with ageing population, India will have a lot of people in working age group, and that will drive our economic growth. Because Chinese didn’t have too many children at one point, they don’t have this advantage. And they are now wondering how they will deal with their ageing population. It's all in the mind: There's a psychological angle too. Because many had only one child, they showered excessive attention on them. Sociologists fear that a cultural time bomb is waiting to go off. The phenomenon is so widespread that there is even a term for it - Little Emperor Syndrome. What if China didn't have this policy at all? It's hard to speculate. Given that even small changes can have a big impact in the long run, we will never know. But, there is a theory that says as countries get richer, fertility rate comes down. In 1979, South Korea had the same fertility rate as China at about 2.9 children per woman, and it dropped to 1.2 by 2008 without any one child policy. You can't step into the same river twice: Given all the side effects of one child policy, one might have imagined that as soon as the government removed the restrictions people will jump to beget more children. But that's not what happened. So China being China is stepping on gas to encourage people to have their second child. But this time, people seem to be resisting. The Eastern European country was ruled by a dictator by name Nikloi Ceausescu. I first came to know about Ceausescu only after he died. It must have been reported in The Hindu, but I remember the images from Pranoy Roy's World This Week, and discussing that with the friends later in the school. In the 60s, the birth rate in Romania was low at 15 births per 1000. Ceausescu wanted it to go up for ethnic and nationalistic reasons, pretty much the way Mao Zedong wanted to. So, he gave tax incentives to people to bear more children. He banned contraceptives. And most importantly, he banned abortions. It yielded the results he wanted. Romania’s birth rate shot up immediately from 15 to 40. However, gradually, the birthrates began to fall. By seventies it had come down from 40 to 20, and by 80s it was back to old rate of about 15. The system fought back. People started using other forms of contraceptives. And then there was an illegal market for abortions. There was even a bigger problem. People were having fewer children in Romania because many couldn't afford to have children. When the children were born, they didn't have the resources to bring them up. They abandoned the children. Orphanages were filling up. But the state was poor too. Instead food, many children got blood transfusions for nutrition. In some cases, infections, including AIDS, passed on to these children. Even at homes, children were undernourished. Big families were packed up in small houses. People hated it. This was not Ceausescu's only bad policy. Things added up. This is Ceausescu's last speech - on 21 December 1989. Check out his facial expressions. He didn't expect the crowd to boo and jeer and raise angry slogans. A few days later, he was killed. When we are writing to tell a story, keep the reader in mind. In his brilliant essay Managing Oneself, Drucker says we learn differently. Some of us learn by writing, some learn by listening, some learn by doing, some learn by talking. Knowing how we learn is key to improving our performance. The entire essay is worth reading. Here is the most relevant passage. How do I learn? The second thing to know about how one performs is to know how one learns. Many first-class writers—Winston Churchill is but one example—do poorly in school. They tend to remember their schooling as pure torture. Yet few of their classmates remember it the same way. They may not have enjoyed the school very much, but the worst they suffered was boredom. The explanation is that writers do not, as a rule, learn by listening and reading. They learn by writing. Because schools do not allow them to learn this way, they get poor grades. Schools everywhere are organized on the assumption that there is only one right way to learn and that it is the same way for everybody. But to be forced to learn the way a school teaches is sheer hell for students who learn differently. Indeed, there are probably half a dozen different ways to learn. Some people learn by doing. Others learn by hearing themselves talk. A chief executive I know who converted a small and mediocre family business into the leading company in its industry was one of those people who learn by talking. He was in the habit of calling his entire senior staff into his office once a week and then talking at them for two or three hours. He would raise policy issues and argue three different positions on each one. He rarely asked his associates for comments or questions; he simply needed an audience to hear himself talk. That’s how he learned. And although he is a fairly extreme case, learning through talking is by no means an unusual method. Successful trial lawyers learn the same way, as do many medical diagnosticians (and so do I). Of all the important pieces of self-knowledge, understanding how you learn is the easiest to acquire. 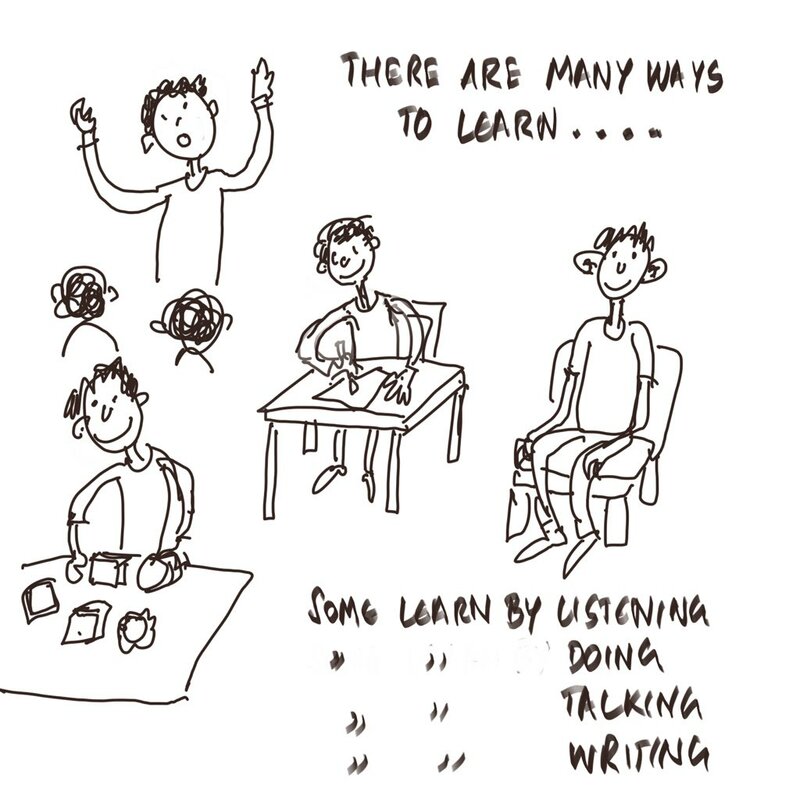 When I ask people, “How do you learn?” most of them know the answer. But when I ask, “Do you act on this knowledge?” few answer yes. And yet, acting on this knowledge is the key to performance; or rather, not acting on this knowledge condemns one to nonperformance. When we are in school, we have it easy. We have syllabus, text books, teachers and students who help us learn stuff. The process is fairly well defined. In real world the learning process is messy, because the world itself is messy. We have to make sense of it, and take decisions one way or the other. Business leaders, policy makers, investors, traders, doctors - all have to look at complex, dynamic world, understand it, and do what may be necessary. It's true of research and some journalism projects too. The life of a journalist such as Kapuscinski consists of untold fruitful deflections. One month he is in India. Then, at the drop of a hat, China is assigned as his patch. He is equally ignorant in both places. But any good journalist, like Herodotus himself, is driven on by an awareness of his own shocking ignorance. And it is that overwhelming need to dispel those clouds of ignorance, to find meaning and pattern amid the world's ceaseless tumult, that drives the serious reporter on. 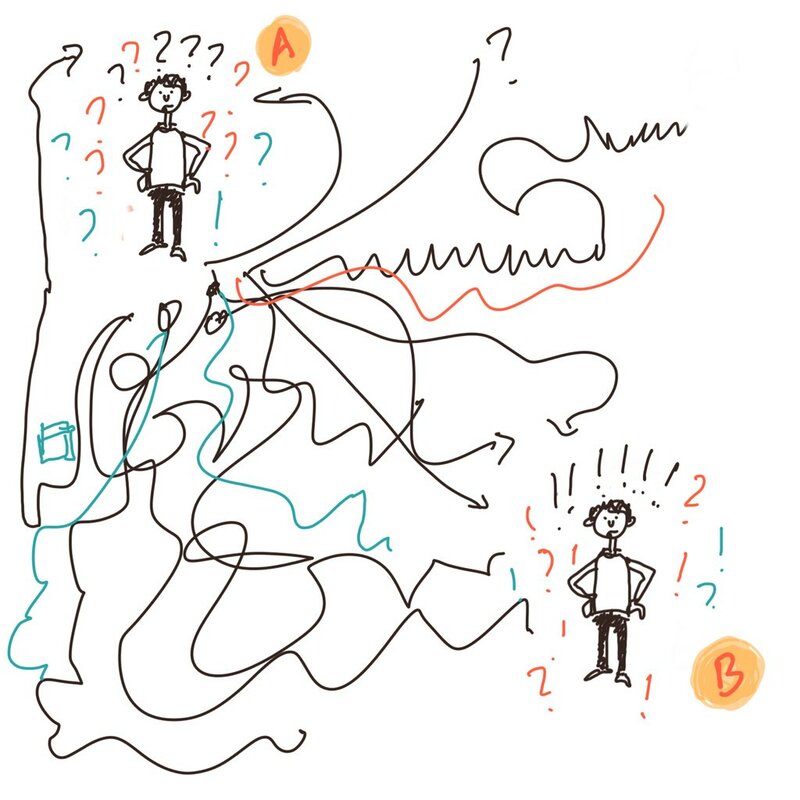 To go from Point A, where you have more questions (often, not even questions) than answers, to Point B, where you have found out answers to some of the questions (and discovered new questions) can be a tortuous journey. 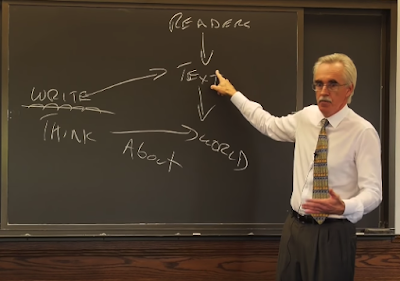 The path you follow to think / write about the world is different from the path that a reader follows to learn about the world you are writing about. Some of the biggest problems with writing comes when we don't think about the path a reader takes. Larry McEnerney, Director of the University of Chicago's Writing Program beautifully explains the point using this illustration. It's worth spending some time listening to him. It's for PhD students, but it has important lessons for everyone in the business of writing. 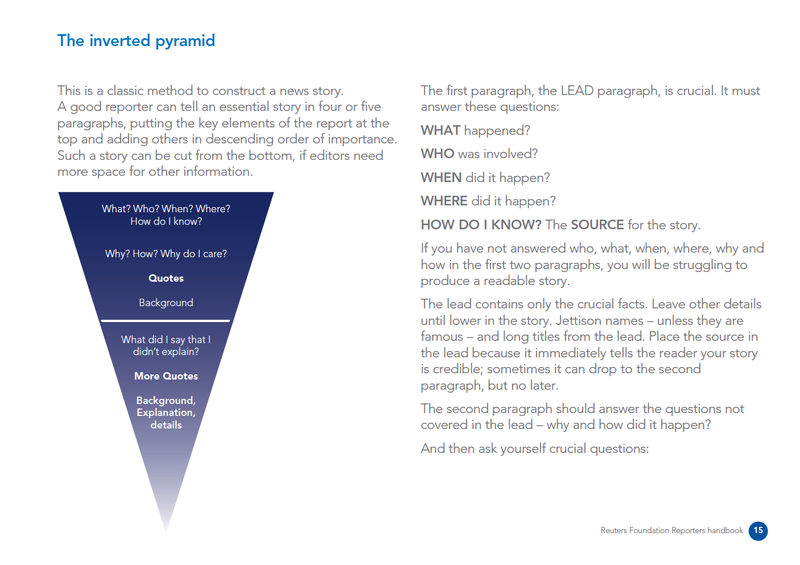 One of the first things that journalists learn when they get into the profession is to learn the inverted pyramid structure. This kind of flattens the playing field for anyone entering the field. 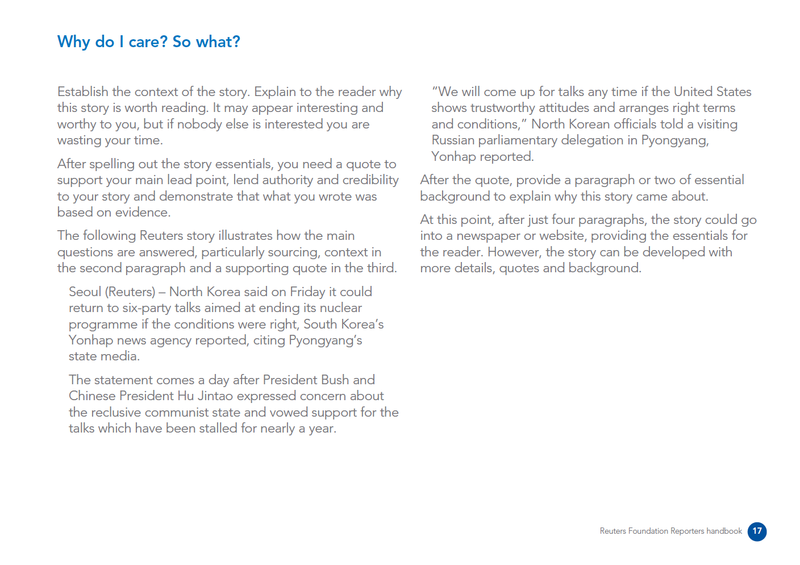 These two pages from Reuters Foundation Handbook for Journalists explains it pretty well. Once we are in the field for sometime, we realise that it's use is somewhat limited. 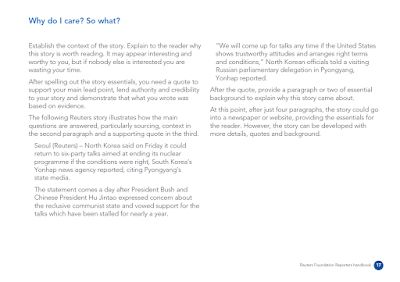 It's fantastic for filing daily news reports. But if you want to write a column, make an argument or write a feature, especially when you write a feature, this simply doesn't work. In fact, spending too much time in journalism, in news reporting, blunts our ability to write well. Not necessarily. Some of the best narrative non fiction writers - Gay Talese, Malcolm Gladwell - went through the grind of daily reporting, and sticking to inverted pyramid structure. But they soon explored other forms - which is probably how we came to know about them. Syd Field, a screen writer, and a screen writing coach, offers this simple illustration. After I read his fantastic series of books - Screenplay. 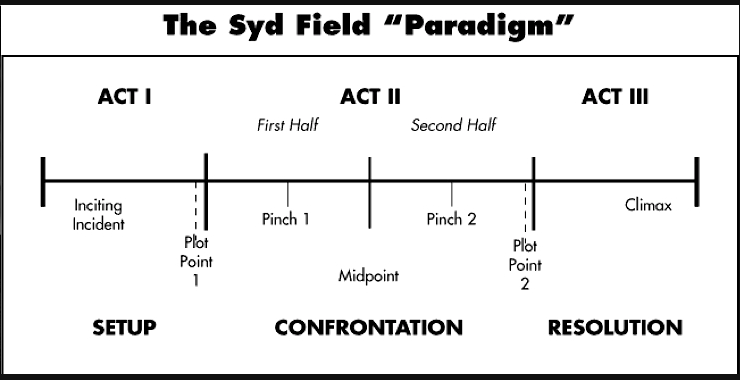 Screenwriter's Workbook, Screenwriter's Problem Solver - I consciously looked for this structure in movies I liked, and they invariably followed this structure at a broad level. In fact, the stories that we have heard as kids from our parents and grand parents pretty much follow the same structure. He tried, and he tried, but at last had to give up in despair. Then a thought came to him, and he took a pebble and dropped it into the Pitcher. 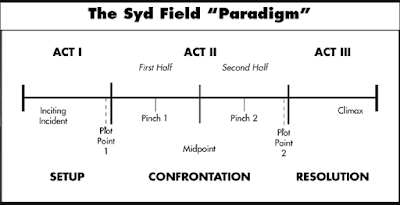 We will find this fitting beautifully into Syd Field's Paradigm. Here are more stories to explore. In his recent book, John McPhee, a fantastic writer who runs a writing workshop at Princeton, goes deep into how he structured some of his more complex pieces. For me, the main takeaway is that you have to think long and hard - and creatively - about the stories. However, the most useful book that I have read on the subject is Barabara Minto's The Pyramid Principle, Logic in Writing and Thinking. The biggest strength of the book is that it's super practical. She taught McKinsey consultants how to write, and distilled her key lessons in this book. Irrespective of what you might think about McKinsey consultants - or consultants in general this book is worth reading. 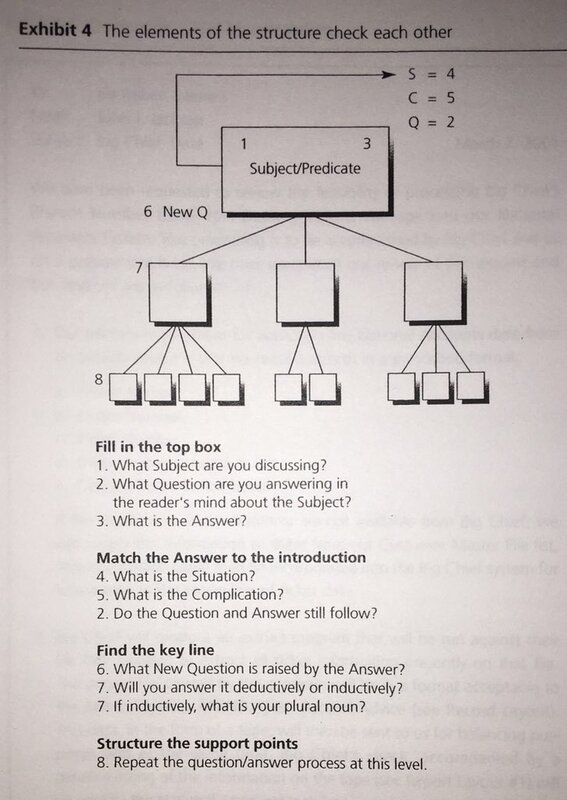 Let me present just two images from the book now, and keep my key learnings from the book for another post. What's the most useful definition of economics? "I do think basic knowledge of the sciences, math skills, economics lot of careers in the future will be demanding on those things. It's not necessary that you will not be writing codes but you have to understand what engineers can do and what they cannot do. How are they likely to revolutionize the field you are in even if you are thinking about sales or marketing the rules of the game will be changed by the digital revolution. And that is only one revolution. Genetic revolution is coming along. More people are trying to get a sense of that. Energy revolution will surprise people in terms of what that provides. Having the frameworks to look at change and understand the impact of the rate of invention that is faster than ever before. People who can adjust to that, help their organisations figure out how to take advantage of the change, that will be there in different job areas. "Historians are specialists in change." "I don't think that historians are specialists in the past. Historians are specialists in change, in how things change and they learn the nature of change by looking at the past. But, you know, the past is gone. Everybody who lived in the past is dead. Nobody really cares about Kings who lived thousands of years ago, in battles that ended centuries ago. The real question is what is happening right now. What can we learn from the past about the future changes and what we should be doing and thinking today. And I see my job as trying to bring more clarity to the public discussion because what I see today in the world is that people are overwhelmed by information, by misinformation, by distraction and they don't realize often what are the most important challenges and changes that we are facing." My big takeaway: As journalists we are in the business of tracking change. We spend a lot of time and energy to track changes in the areas we cover. Bill Gates' point about having frameworks to understand change and the impact of disruptive tech; and Yuval Harari's point about past being a guide for the future are pertinent. Something that we don't think much about. I was in college when I read Michael Crichton's Andromeda Strain. If I try hard I might remember the broad storyline and, may be, a few scenes from the book. But, it's so many years since I read the book that it's unlikely that my recollections will be accurate. But, there is one thing I clearly remember from the book: the shock, a kind of moral reprehension, I felt after I read this section. DIRECTIVE 7-12 WAS A PART OF THE FINAL Wildfire Protocol for action in the event of a biologic emergency. It called for the placement of a limited thermonuclear weapon at the site of exposure of terrestrial life to exogenous organisms. The code for the directive was Cautery, since the function of the bomb was to cauterize the infection “- to burn it out, and thus prevent its spread. As a single step in the Wildfire Protocol, Cautery had been agreed upon by the authorities involved-- Executive, State, Defense, and AEC-- after much debate. The AEC, already unhappy about the assignment of a nuclear device to the Wildfire laboratory, did not wish Cautery to be accepted as a program; State and Defense argued that any aboveground thermonuclear detonation, for whatever purpose, would have serious repercussions internationally. The President finally agreed to Directive 7-12, but insisted that he retain control over the decision to use a bomb for Cautery. 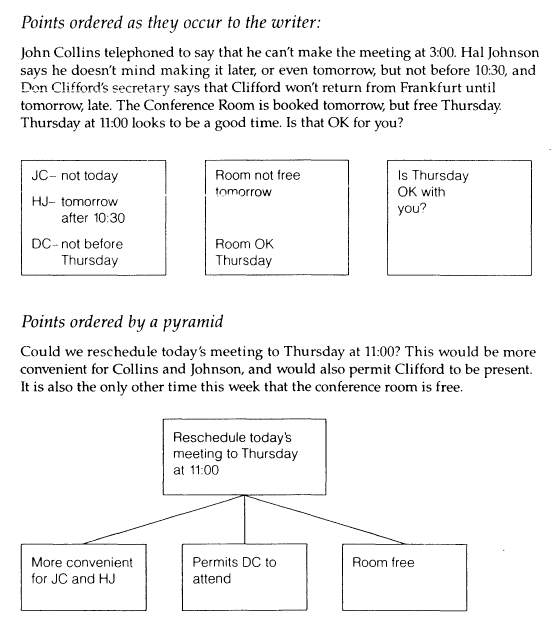 Stone was displeased with this arrangement, but he was forced to accept it; the President had been under considerable pressure to reject the whole idea and had compromised only after much argument. Then, too, there was the Hudson Institute study. A satellite or manned capsule lands in an unpopulated area of the United States. The President may “cauterize the area with little domestic uproar and small loss of life. The Russians may be privately informed of the reasons for breaking the Moscow Treaty of 1963 forbidding aboveground nuclear testing. A satellite or manned capsule lands in a major American city. (The example was Chicago.) The Cautery will require destruction of a large land area and a large population, with great domestic consequences and secondary international consequences. A satellite or manned capsule lands in a major neutralist urban center. (New Delhi was the example.) The Cautery will entail American intervention with nuclear weapons to prevent further spread of disease. According to the scenarios, there were seventeen possible consequences of American-Soviet interaction following the destruction of New Delhi. Twelve led directly to thermonuclear war. A satellite or manned capsule lands in a major Soviet urban center. (The example was Stalingrad.) Cautery will require the United States to inform the Soviet Union of what has happened and to advise that the Russians themselves destroy the city. According to the Hudson Institute scenario, there “were six possible consequences of American-Russian interaction following this event, and all six led directly to war. It was therefore advised that if a satellite fell within Soviet or Eastern Bloc territory the United States not inform the Russians of what had happened. The basis of this decision was the prediction that a Russian plague would kill between two and five million people, while combined Soviet-American losses from a thermonuclear exchange involving both first and second-strike capabilities would come to more than two hundred and fifty million persons. As a result of the Hudson Institute report, the President and his advisers felt that control of Cautery, and responsibility for it, should remain within political, not scientific, hands. I don't remember exploring why I felt that way, why I felt that I was reading about something that is morally lacking. My sense is we don't spend too much time thinking about why something is right or wrong. We go by our instincts, by our feelings. Abraham Lincoln said, "when I do good, I feel good; when I do bad, I feel bad." I suppose we use a similar heuristic when we judge the morality of an act: "If we feel good, we decide it's moral, and if we feel bad, we decide it's immoral." Now, after all these years, I wonder why I felt that way. Was it because of the unfairness of it all? After all, people in Chicago or New Delhi or Stalingrad had no role in making the satellite, they didn't do anything to attract it. Yet there were some people sitting in Washington, who could decide their fate. The fate of hundreds of thousands of people. Was it because the example was New Delhi. Would I have felt differently, if it had been Beijing instead? Was I even comfortable with thinking consciously about having to make a decision about dropping nuclear bombs? I don't know. It's not a luxury that everyone has. Some have to explain their decisions. They have to give reasons. The passage from Andromeda Strain is an example of that. The president had to explain why he took a specific decision to the people who elected him. It's because he was making decisions on behalf of them. He has to convince them that he took the right decision. We have outsourced some decision making to the elected officials, and they owe us an explanation. Increasingly, as a society, we are outsourcing some of our decision making to technology. Machines are doing a lot of stuff that we used to do. Most of them are rules based. And right now they are acting in a rather controlled environment, like industrial robots in shop floors. But, machines are coming out of shop floor. 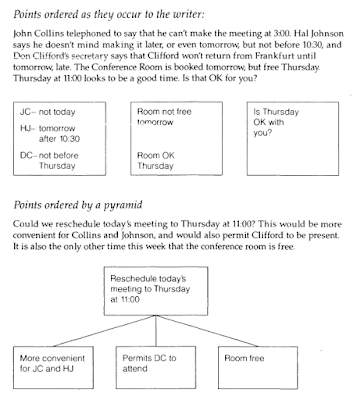 They are getting into areas where people used their judgements to make decisions, rather than a flowchart in their rulebook. Like giving loans, or driving a car. Some of it might involve choosing between two equally right options. There are a lot of debates around how to ethical machines will be. (In 2015, even I wrote a piece on that in The Hindu blog, arguing that utilitarian approach has a better chance, compared to deontological approach). May be, it will take some time before machines learn ethics. What is important as of today is to understand how technologists think about ethics and how their moral world view gets reflected in the algorithms they write. Which means that journalists who write about tech should also be well versed in that - not just about what tech will do, not just about what the business model is, not just about their value proposition - but also about their moral worldview. In 2016, when I met Sanjay Jain, a key member of the team that designed and built Aadhaar, I asked him what he made of the critics of Aadhaar. It was well before the government made Aadhaar mandatory for PAN and for filing income tax returns, and one could still have sane discussions on the project. He replied. In their book, Rebooting India, Nandan Nilekani and Viral Shah offered this helpful illustration to understand where opposition to Aadhaar came from. 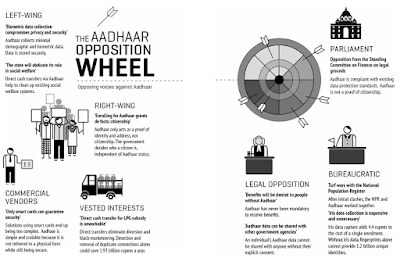 They grouped the critics under seven categories, along with their main objections to Aadhaar. In April last year, author and journalist Manu Joseph offered a another grouping in his column in Mint newspaper. Manu Joseph went on to speculate why some of them, especially those who care for the rights of the poor jump on Aadhaar instead of using the technology to empower the poor. It is hard to ignore the possibility that some social activists would have seen Aadhaar as a direct threat to their turfs. One way in which rural activists tried to rebuke Nilekani was by reminding him how little time he had spent in the villages of India. “Even among them they would fight over who has spent more time in the villages. Spending time in the villages was some great marker for them,” he says. 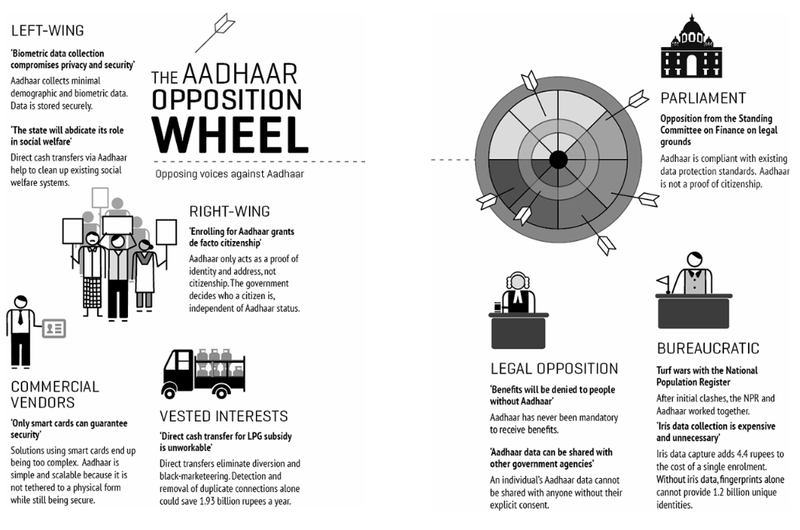 When Charles Assisi and I were reporting on Aadhaar for our book, not only did we come up with people who had a wide range of critical views on the project, we also came across many who wanted to know why there was so much opposition. We used to tell them what we thought were the most serious objections - exclusion, fraud, bad implementation, privacy. The answer usually was, but can't these be fixed with technology, law, regulations, user education? And so it will go. I was still trying to see if there are other ways to put the criticisms I have heard neatly into buckets - just so that we remember them even as we reported and wrote the book. Once, when I was talking to my colleague CS Swami, who has guided a number of technology implementations in large corporations, he shared a lot of stories on the kind of resistance he and his team have faced. 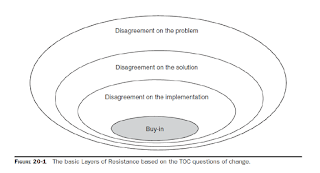 He shared a fantastic essay from Goldratt Consulting, called The Layers of Resistance. As I read it I imagined the process as one door opening after another. Many of the criticisms we heard during our reporting also fell neatly into this framework place (we had to do a bit of tweaking). In the book it forms a mini chapter, under the title, 'Who is Afraid of Aadhaar?' - organised a bit differently because it had to fit into the tone and flow of the rest of the book. 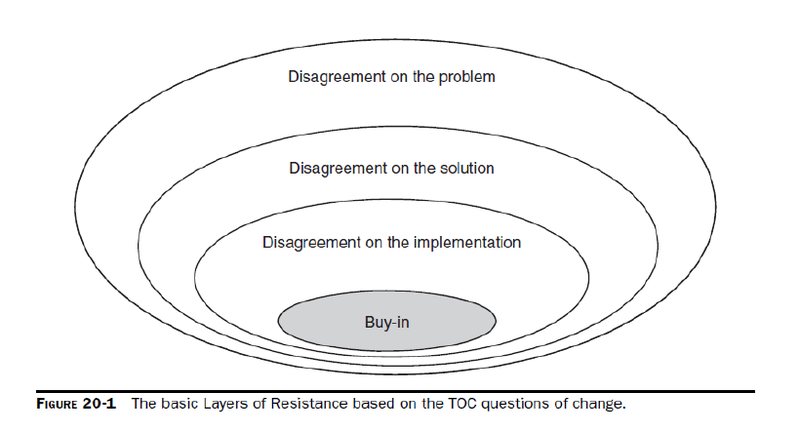 Here, let me present the same points in that more or less aligns to Layers of Resistance. Part of the reason why I am putting this out here is to see if I can add more to the list, or to see if I can organise this list better. Would love to add more examples too. A. What are the criticisms about? B. Where are they coming from? What are the criticisms about? The intention of those who thought up, designed and executed Aadhaar are bad. It’s true of the government, and it's true of the private players who were involved in the project. 1.2 The government basically wants to empower itself, have more control over the people, and Aadhaar is primarily a mass surveillance system. 1.3 The private players, starting from Nandan Nilekani onwards were in it to make make money or to gain power or at least for getting access to people in power. 2.5 "Problems that Aadhaar promises to solve don't exist in first place." 2.5 “Well, the problems may exist, but they have nothing to do with lack of identity." We have to fundamentally question the need for a national identification like Aadhaar, when we know that advanced countries such as Canada and Australia are doing well without national id programmes. Biometrics are also probabilistic - which means there will be false positives and false negatives (Unlike a password, which is an yes or no). It is always prone to both exclusion and fraud. We should learn from other countries and ask why UK abandoned its biometric id project. In fact, democratic countries don't have biometric ids, according to an analysis by two researchers. They asked, if “countries with a poor democratic record more likely to mandate an Aadhaar-like ID?” and found out that was indeed the case. Making Aadhaar online only is a bad idea, because it leaves too much chances to external factors such as internet connection, third party devices, websites and so on. Smart cards would have been a better alternative, because it is a more established technology. It can also sidestep some of the problems related to centralised storage of biometrics. UIDAI wanted to scale up fast. However, it has sacrificed quality at the altar of speed. It used private players for enrolment, which is wrong in first place. The selection of enrollment agencies was rigorous. As a result, too many rotten apples had entered the system, and they had to be suspended. The applications developed for enrolment were not secure enough, and it emerged that they could be hacked. The defective enrollment process has meant we have with us a large unverified database. And an unverified database is essentially useless. Applications designed by various state and district administrations are faulty. For example, in PDS, telangana govt designed it in such a way that only the head of the family can buy from ration shops. The government has been pushing Aadhaar adoption too fast. The government has been pushing Aadhaar even in places that have no compelling reason. For example, for death certificates, for mobile phones, for drivers license, for bank accounts. It was supposed to be mandatory only to avail government services. Government constantly flouts Supreme Court orders, by pushing Aadhaar in various schemes, even though it had passed orders limiting the mandatory use of Aadhaar. 5.25 "Aadhaar did not follow best practices"
UIDAI didn’t do enough public consultations (esp technical). It’s not open to outside expertise. It doesn’t organise bug bounties to ensure that its security measures are good. Many government agencies have a cavalier attitude towards handling user data. Even where they want to treat it carefully, they do not have the capacity to do it. Sometimes, just a Google search is enough to access the data. In some cases, basic hacks are enough to access the entire database (as it happened in the case of Telangana state government). The case highlighted by Tribune in Rajasthan shows that the credentials to access data can be bought for as low as Rs 500. In effect, while the biometric data might be secure in the central data depositary, the ecosystem is so leaky that sharing Aadhaar numbers anywhere is not safe. Besides problems with Aadhaar law - only UIDAI can raise complaints - we don’t have the infrastructure to provide justice for the potential victims. Aadhaar is being thrust on people without giving them enough time to learn the risks and responsible use of their own data. It’s not just about the users - who give away their Aadhaar numbers and other sensitive information - it’s also about the data handlers, who often insist on the photocopies of Aadhaar. This often defeats the very purpose of online authentication. 7.31 "A large scale enrolment fraud happened, and what we have is a junk database"
That Aadhaar enrolment system can be manipulated to give fake ids became evident even in the early days, when a man got his dog, Tommy Singh, enrolled for Aadhaar. Another person got an Aadhaar for Lord Hanuman. Frauds got more sophisticated over time. In UP, for example, police caught a gang that was using an hacked client application to enroll users. 7.31 "You can bypass Aadhaar biometric authentication." The strength of Aadhaar authentication is supposed to be its biometrics. A researcher showed that the system is prone to replay attacks (your biometric can be stored in a device and be used to authenticate). UIDAI came up with a solution that makes such attacks difficult, but it also filed a case against Sameer Kochar, the researcher. The system is still prone to other kinds of manipulations including fake fingerprints. With the prevalence of high definition cameras, and the progress of 3D printing, it wouldn’t be too long before making fingerprints a trivial task. 7.31 "Aadhaar has resulted in exclusion of people from government entitlements"
7.32 "Ghosts aren't ghosts. People haven't been linked"
One of the earliest fears of the social activists was that by linking Aadhaar to subsidy scheme, those who don’t have the identity will get excluded, and that the government would simply count them as ‘ghosts’ - or fake accounts leeching the system. One would have thought that with more than 1.2 billion people enrolled for Aadhaar this problem would go away. However, surveys show that to this day not all not all “ghosts” are ghosts. Genuine beneficiaries also get excluded, because for various reasons the linkage with the schemes don’t happen. 7.33 "Some Aadhaar enabled systems were designed to exclude people"
In some cases, the solutions are designed so badly, that it excludes people at the last mile. For example, in one case, the system allowed only the head of the family to take rations from the PDS shops, in departure from the earlier system where anyone with the document could buy the rations, for any number of reasons. The head of the family might be out travelling, or at work, or may be unwell. Bad design of solutions can exclude people. 7.34 "Aadhaar has led to exclusion because of authentication problems"
7.35 "Aadhaar has aided bureaucratic (manual) exclusion"
Aadhaar doesn’t solve all the problems. Often, it becomes another excuse for the system not to give the entitlement to the beneficiary. 7.36 "Aadhaar database can be breached"
That the core database of Aadhaar has not been breached so far is no guarantee that it will not happen tomorrow. Right now, UIDAI expects people to take its word that its safe and secure. However, going by how they have reacted to the breaches in the ecosystem, and by the lack of visible best practices, it’s doubtful that UIDAI has the capacity to keep the database safe. Especially at a time when the battleground is shifting from the real world to the cyberworld. Countries such as US have been investing significant resources on cybersecurity. There is no evidence that India is doing enough to protect the data. 7.37 "Aadhaar ecosystem has been leaking data"
Even if core biometric database is safe, the ecosystem might not be safe. 7.38 Government continues to claim that Aadhaar has helped it save billions of dollars, despite the absence of any evidence. In fact, publicly available data suggests that the cost savings from Aadhaar has been minimal. 7.39 Aadhaar is likely to lead to intrusion of government (and even businesses) into our private lives, violating our fundamental right to privacy. 7.41 All the nudging and enforcement to use Aadhaar is likely to increase government dependence of technology, before the infrastructure is ready for it. It means, intelligence is in seeing the truth irrespective of who says it. But having heard these arguments over and over again, it was interesting to see people taking on specific identities as they made their arguments. There were broadly six types - perfectionist, ideologue, egotist, conformist, outraged, lobbyist. And this website helped me to see that the first letters formed a word: POLICE. But let me give it in pairs - because while any type can become any other type, the most transitions happen between those who are paired. The Perfectionist: The perfectionist simply wants things to be perfect. There should be no error. She doesn't believe in things like, "hey, give it time the system will improve". After all, it's an important project. Small mistakes can have a big impact on people. When something is worth doing, it's worth doing perfectly. The Ideologue: The ideologue doesn't like big governments, or she doesn't like private sector, or she doesn't like Manmohan Singh, or she doesn't like Narendra Modi, or she doesn't like technology - and therefore she doesn't like Aadhaar. She can quote examples after examples, give evidence after evidence to prove her position. The Conformist: The conformist simply goes by whatever her group says. If every other journalist in your newsroom says the project needs to be criticised, that it needs to be looked at with a certain slant, better go by that. Ambitious conformist not only go by that, they also make it a point to express those views louder than others. The Egotist: The egotist just can't understand how someone else can claim to solve issues that she couldn't; how someone else could claim to have built a system that works. Egotists come in all shapes and sizes - aggressive, passive aggressive, arrogant, humble, loud mouthed, silent, silent, sarcastic. But mostly sarcastic. The Outraged: The outraged is angry about everything - and project has given her enough reasons to be angry about. The strength of her stand comes from her feelings, her emotions. A few minutes with her, you are wondering why you are not as outraged. The Lobbyist: The lobbyist is good at arguing why smart card is better, or why Aadhaar should not be linked to PAN - always speaking for some special interest group - while making it seem as if she is talking on behalf of the poor. By the tone, you might have guessed that this hasn't found a place in the book. The chapter on critics is actually told as a story - on how two diverse groups of people came together to fight their case against Aadhaar in Supreme Court. Whether they are happy with the outcome - whether anyone is happy with the outcome - is a big question. I will give my own perspective in one of the future posts. Yet, there were three sets of critics who were extremely helpful both in process of writing the book, and, I suppose, for the Aadhaar project itself. The Ethical Hacker: I am not using this in the traditional sense, but generally for someone who understands technology, makes some efforts to find out small and big vulnerabilities in the system, with the purpose of making it better. 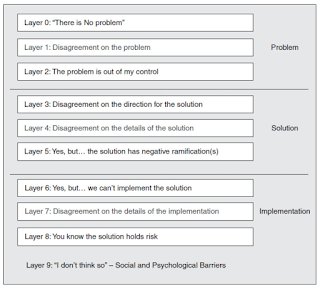 The Systems Thinker: Systems thinkers spend a lot of time thinking about unintended consequences and the risks of emerging qualities, they offer some of the most insightful criticisms. The Chronicler of Maladies: They provide the essential feedback to the system to make it stronger. The difference between The Chronicler and the lobbyists (who also chronicle some of those maladies) is the intent. The Lobbyists want a specific outcome which is often bad for the people they are claiming to be speaking for but good for the group they are working for. As a journalist myself (please keep this disclosure in mind as you read this) I would like to think that journalists belong to this group. 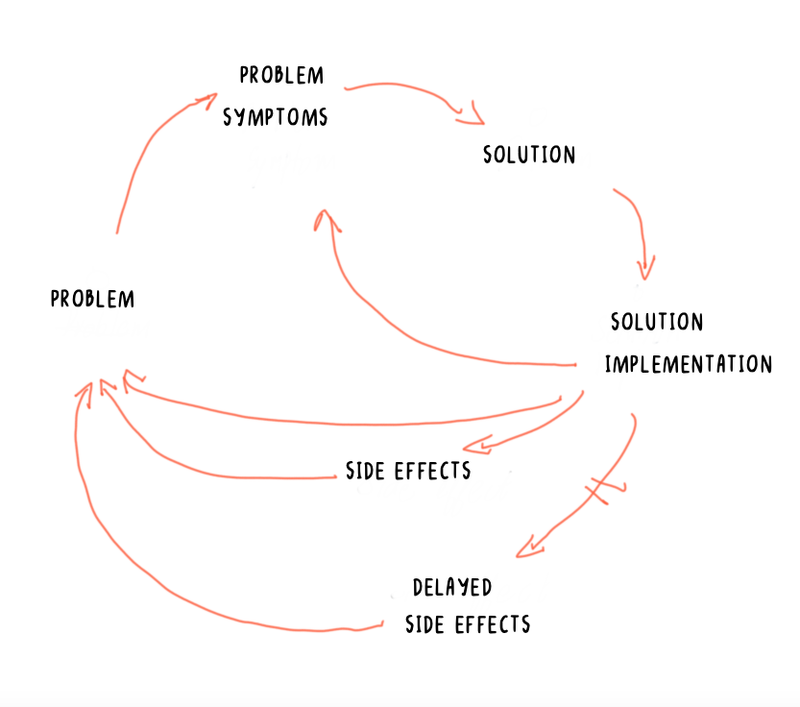 They look for stuff that's not working and form the essential feedback loop in the system. Unlike the feedback that goes from the lobbyists, this works because the system knows there is no hidden agenda. If you think I have left out any important category of criticism or if I can strengthen the criticisms here with good references or if I can add to the categories of critics - please do leave a comment, or DM me on twitter at @rmnth. On Saturday, 19 October 1985, Melvin Kranzberg, a historian of technology, spoke at Henry Ford Museum in Dearborn, Michigan. In his lecture, he spelled out what he termed Kranzberg's Laws. "These are not laws in the sense of commandments, but rather a series of truisms drawn from a long time immersion in the study of the development of technology and its interaction with sociocultural change," he said. Here are his six laws. Technology is a very human activity - and so is the history of technology. 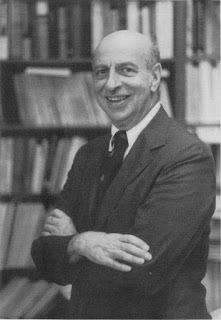 His speech was published in July 1986 issue of Technology and Culture under the title Technology and History: "Kranzberg's Laws". To read a summary of the six laws, click on the image below. Let's get straight into how these laws apply to Aadhaar. 1. Technology is neither good nor bad; nor is it neutral. One of the most common question that my coauthor Charles Assisi and I get is whether Aadhaar is good or bad. May be such a question would have come up anytime about any technology, but in this era of polarised debates, it's only too common. Our question is, it depends on the context. It depends on the intent, capacity and needs of the system. Aadhaar can be a force for good. In a village on the borders of Tamil Nadu and Karnataka, we met a bunch of ladies who were very thankful for Aadhaar. These women were street vendors, manual labourers etc. Earlier when they wanted money they used to get it from a micro-finance company, joining a bunch of other women from the same village. Now, thanks a social enterprise, they had recorded their financial transactions, had taken a few lessons on personal finance, and could borrow from a bank, just like you and I can. While many see a tradeoff between privacy and convenience; while many argue that you have to give up a little bit of your privacy for some benefits, here was a case where using Aadhaar enhanced both privacy and convenience. It's pretty much the same story when it comes to submitting a photocopy of your driver's license, passport etc to get a phone connection. You not only give more information than what's needed, you also don't know how it will be used between the time you submitted and Airtel or Vodafone acknowledges a week later. eKYC on the other hand enhances both privacy and convenience. In a village in Andhra, I joined a banking correspondent as she went from home to home, disbursing pension. We met an old lady lying in her cot in the porch of her house. She had to be helped up from her cot. She authenticated herself and got her money in a matter of minutes. The nearest bank branch was some 5 kms. I spoke to a guy who was running a PDS shop, which was running an Aadhaar enabled system. he said, earlier even if he had been clean, everyone looked at him with suspicion. Now, there was trust. There are second order benefits too. Aadhaar enabled people to give up their LPG subsidy, crores of people gave up, which made it easy for the government to pass it on to people who were using solid fuel for cooking. Solid fuels is a major source of pollution, causing disease and premature death. There are several cases such as these. But, it has also been bad for some. I have heard old people struggle to get their finger prints authenticated. I have heard of cases when people had to make several trips to ration shop because there was no connection and so on. It can be frustrating even for those who have all the time in the world, but it's terrible for poor. Unlike the rich, poor don't have the cushion, and when they face a shock, like not getting their rations, it could be life or death. That Aadhaar, by itself is neither good nor bad, is not to say it's neutral. No technology is neutral, because it impacts people's behaviour. It changes the system. Invention of rocket created a need for fuels with greater thrust. iPad created a need for better stylus and wireless headsets and so on. Cars created a need for better roads, traffic signals etc. Electric cars are creating a need for better battery tech and systems. We can experience the full benefit of any of these inventions only when these new needs are fulfilled. It is true for any technology, it's especially true for Aadhaar and India Stack - because they were built as platforms. They were designed so that innovations happen on the top. A good way to describe Aadhaar and India Stack would be: digital infrastructure. Digital highways. When Nandan Nilekani and his team explained this to Pranab Mukherjee, he immediately said something like, "you have laid the tracks. Now trains have to start running on them." Phonepe is a good example of a train running on UPI tracks. A bunch of engineers moved out of Flipkart, founded a startup, built a payments app called Phonepe, and the company was bought over by Flipkart. It made payments very easy. Download the app, fill in virtual address of the person to whom you want to send money, type in the amount, enter your pin, and hit the send button and that's it. You can also use it in offline stores. To make that process easy, Phonepe launched a POS terminal, which looks like a pocket calculator, and costs a fraction of traditional POS terminals. At a NREGA location - national rural employment guarantee act, which guarantees at least 100 days of work in rural areas - I saw people lining up to withdraw their earnings from a banking correspondent who carried an Aadhaar enabled device with him, that could authenticate users, check their bank balance, and even give a receipt. If you had any doubts about poor people taking on to new technology, it will be cleared if you watch how the efficiency with which they went about it. Broadly speaking, Aadhaar necessitated both vertical and horizontal technological developments, some of it at the intersections. Just as how you need good roads for cars to work well, you needed improvements in telecom networks for Aadhaar to work well. 3. Technology comes in packages, big and small. Newton said he could see farther only because he stood on the shoulders of giants. The observation is as true for technology, as it is for science. Gutenberg could not have built his Movable Type, but for the advancements in metallurgy and chemistry and other fields. Henry Ford similarly assembled existing technologies to build his assembly line, adding some of his own. I often wonder if Aadhaar in its present form would have happened if it were designed end 1990s rather than in end 2010s. And how different such a system would be were it to be built today. Aadhaar depended on a whole range of developments - biometric scanners, deduplicating algorithms, laptops at certain price points, growth of mobile, availability of USB sticks, encryption technologies and so on. Aadhaar as a system might be doing just one specific thing - check if your biometrics matches your Aadhaar number, and give yes or no. But, to do that, it had to put together a range of technologies. It needed expertise from all over the world. Nandan Nilekani and his team reached out to best researchers and technologists - Prof Anil Jain, foremost authority on biometrics, for example. Some of them reached out to Nandan - Pramod Varma, for example. A silicon valley veteran Raj Mashruwala went around US and India, giving talks in the US and in India to the alumni of top universities. Sanjay Jain, who was the product manager of UIDAI, came in that way. The point is, Aadhaar needed technology talent from a wide variety of backgrounds and disciplines. Of course there were people who take credit without having moved a finger. Charles and I met a guy in Bangalore, who said he had actually worked on Aadhaar, wrote a few modules for the project, but he is now worried about the system. We asked him for more information. It was back in 2007, man. Are you sure it was in 2007, are you sure it's not 2009 or 2010. He was damn sure. Only, Nandan was still at Infosys at that time. Pramod Varma was a part of Sterling in US. Sanjay Jain was working on Mapmaker in Google. 4. Although technology might be a prime element in many public issues, nontechnical factors take precedence in technology-policy decisions. There is a general feeling that like how the best team will win in a football match, "the best technology" will win in the real world, and it's fairly easy to look at the metrics, compare and identify good tech. Like water that finds its own level, like a better mousetrap that will have people beating their path to buy, a tech solution will find its own place. Except, that the real world is more complex. Aadhaar is a technology project, but the biggest fights, the biggest discussions, and the biggest decisions were not around tech. Most of them were fought not in Bangalore, where the technology team was, but in Delhi. Turf wars: UIDAI fought a bitter battle with Home Ministry over who will do the enrolments. Home Ministry was already in the process of building a National Population Registry and it thought UIDAI was stepping into its turf. Bureaucrats basically wanted UIDAI to be the technology backend for NPR, but UIDAI wanted to give unique numbers to 600 million people within five years. Ego clashes: UIDAI was a division of planning commission, but it had a much bigger budget. And it could bypass planning commission for a several approvals. Planning Commission secretary once tried to derail the project by trying to launch an investigation by CAG. Power plays: During UPA regime National Advisory Council was powerful and had the ears of Sonia Gandhi, and they didn't like Aadhaar for a number of reasons. It insisted that the project needed its approval, which would have essentially stopped it. Special Interests: UPA government stopped Aadhaar-LPG rollout because lobby groups convinced party leaders that it would cost them votes. These are just a few non technical forces that determined how Aadhaar rolled out in the country. There are many more in the book. 5. All history is relevant, but the history of technology is the most relevant. The person who tells the best story wins, and the stories are often fuzzies rather than techies. As a result, we tend to miss crucial lessons from history of technology. Feminists don't give enough credit to the role played by labor saving devices and the Pill to their movement. Caste activists don't think about the role railways played in loosening the grip of caste system in the country. Many forget a one of the biggest lessons from history of technology, and that is technology diffusion takes time. Carlota Perez in her brilliant book, Technological Revolutions and Financial Capital: The Dynamics of Bubbles and Golden Ages, says that technological revolutions happen in four phases, irruption, frenzy (when the technology gets installed), synergy and maturity (when the technologies are deployed). 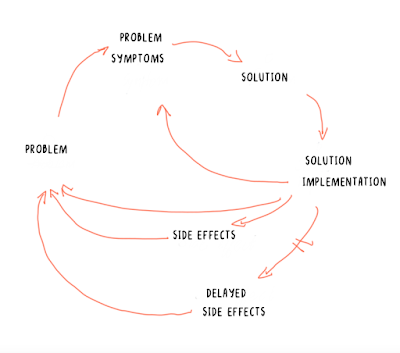 Irruption is when innovations happen fast, early products get introduced into the market. It phase lasts about 10 to 20 years. It’s followed by frenzy stage, when there is intense investment, introduction of new products and industries. By this time we get to see a constellation of products (not merely early products) that came out of the revolution. This also takes 10-20 years. Synergy phase is the golden period. New products and new industries continue to come up. We have a full suite of products and industries now, and the second order impact of the revolution starts to show. And finally, we have the maturity phase, when the last products come out, market gets saturated and it’s time for a new revolution. In short, it takes time. That's why we tend to overestimate the near term consequences of technology and under estimate its long term consequences. In the case of Aadhaar, we saw pretty much the same thing taking place. The basic infrastructure was rolled out very fast, as it should have. However, it takes time for governments, businesses, social sector to build innovations on the top of it. It takes time for them to get it right. It takes time for the best practices to spread. On the top of this, it also faced huge opposition from people for various reasons, some of them not honourable. Aadhaar is now 10 years old, and there is much to learn from its rollout. Harvard has at least two case studies on Aadhaar. Interestingly, people who learned most from Aadhaar are those who were in teh middle of it. Shankar Maruwada, cofounder of ek step and a part of the team that built Aadhaar says that they follow Act, Learn, Act, Learn, Act cycle. Their societal platforms is a result of that exercise. 6. Technology is a very human activity - and so is the history of technology. In his speech Kranzberg narrates an interesting story. You see, the instrument, the hardware, the violin itself, was of no use without the human element. But then again, without the instrument, Kreisler would not have been able to make music. The history of technology is the story of man and tool - hand and mind - working together. If the hardware is faulty or if the software is deficient, the sounds that emerge from it will be discordant. But when man and machine work together, they can make some beautiful music. As I followed the debate on Aadhaar, on television, stage and even in drawing rooms, I noticed it was framed as if it is people versus technology. May be, we look at it that way because we are influenced by dystopian movies - which always pitch humans against technology. "I think one of the things that really separates us from the high primates is that we’re tool builders. I read a study that measured the efficiency of locomotion for various species on the planet. The condor used the least energy to move a kilometer. And, humans came in with a rather unimpressive showing, about a third of the way down the list. It was not too proud a showing for the crown of creation. So, that didn’t look so good. But, then somebody at Scientific American had the insight to test the efficiency of locomotion for a man on a bicycle. And, a man on a bicycle, a human on a bicycle, blew the condor away, completely off the top of the charts. We get the close relationship between man and machine when machine had been around for a long time. No one actually tells a violinist your violin makes such beautiful music. We say, 'you played it beautifully'. But, when it comes to new technologies, we fail to see how closely man and machine are connected. We tend to look at technology as if it's separate from human beings. We end up making things worse - ultimately for humans. We start with the right question: "Will this technology empower society, or disempower society". But, we end up never getting to the right answer. And the right answer often is: "It depends on us, human beings."